After last week's seismic explosion, eruptive activity at Turrialba Volcano resumed Monday with two new explosions, one of which reached nearly 4,000 meters (13,100 feet) in height, according to reports from the National University (UNA). 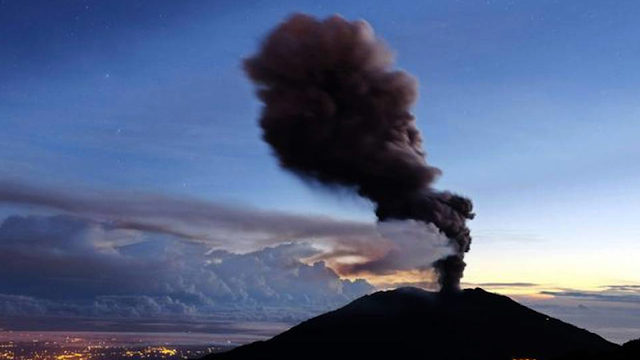 The first eruption of Turrialba, located in Cartago province, some 50 kilometers east of San Jose occurred at 2:53 a.m. and lasted about 15 minutes. The explosion launched ashes, gases and incandescent rocks into the air to about 1,000 meters (3,280 feet) above the volcano's crater, UNA's Volcanological and Seismological Observatory of Costa Rica (OVSICORI) reported. The second explosion occurred at 11:32 a.m. and spewed material about 13,000 feet into the air, the agency said. OVSICORI volcanologist MarÃ­a MartÃ­nez said that after the second explosion, reports were received of ash falling in communities north and west of San Jose, including Coronado, Moravia, TibÃ¡s, Guadalupe, EscazÃº and as far away as Alajuela province. A report from the University of Costa Rica's National Seismological Network (RSN) states that the second explosion lasted about 13 minutes. RSN volcanologist Raul Mora said the explosion also launched a large amount of gas, ash and rocks into the air. Delta, Copa, Lacsa, United and Southwest have all cancelled flights scheduled to arrive at Juan SantamarÃ­a International Airport between 6 p.m. and 11:30 p.m. Monday. Travelers are advised to check with their airline for flight status. The Juan SantamarÃ­a International Airport outside of San Jose closed at 5 p.m. for the second time Monday. The airport is scheduled to remain closed until 9 p.m., an airport spokeswoman reported. One JetBlue flight scheduled to leave in the evening was cancelled. A Southwest Airlines flight scheduled to arrive at 8:40 p.m. was cancelled. Customers should check with their respective airline for flight status.